Our cars are parked in chevron formation, lining Market Street in the old Dutch-gabled town of Cradock. In the fading light of the day they are ready for tomorrow's re-start looking as if they are all urging their drivers to perform a mass start by running across the road in Le Mans style. Getting here has been a gentle drive through the vast empty plains of the Karoo, passing fields of long fescue grass that bows as we drive past the creaking tin windmills that pump up water from artisan wells. Long plumes of dust spiral out like vapour trails from behind each car as the Classic Safari thunders east into the early-morning rising sun. It has taken two days since our last report to reach Cradock. 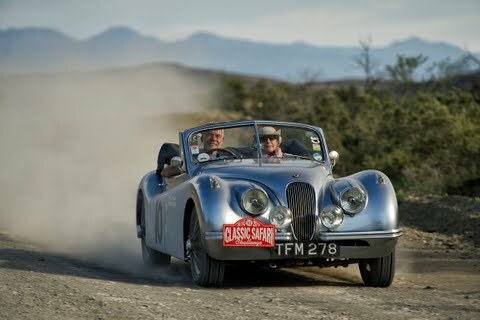 We had set out from Oubaai, Mossel Bay, to drive over the stunning Swaertburg Pass, breathtaking, in every sense, the route plan of Kim Bannister won universal praise at the summit: "Marvellous... what an amazing road, so well worth the effort," was the verdict of Philip Haslam as he parked his Jaguar XK140 at the top of the mountain. There was then the tricky matter of negotiating the descent, steep and rocky several crews overheated their brakes, Keith Ashworth stopping for a prudent pause to let the big drum brakes of the six-litre Bentley cool off, but the crew of the Chevrolet Bel Air, Scott and Salome Pouroulis, lost their hydraulics and had a more nerve-racking descent requiring the attention of the sweep mechanics. Coming into Beaufort West last night the vintage Crossley required a new water hose. So, what would you do? If you knew you had arrived at civilisation at the end a long day, knew that behind at least one of the many doors there must be the solution to your problem, but found no garage open, and all the shops had closed? Andrew and Gina Long remembered being told at the briefing that "rallying is an initiative test", so they drove around town until they found the police station. Here they asked the question: where in Beaufort can we fix a vintage car with a leaky radiator hose? "Madam, you have come to the right place, you are welcome to use the police repair workshop around the back". 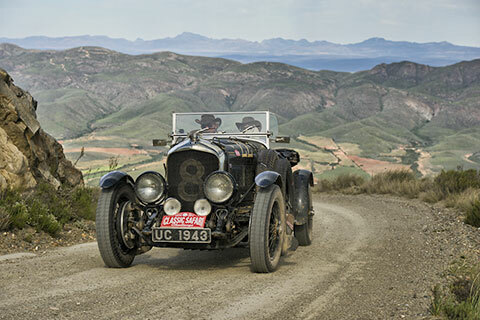 Alas, the adventures of the oldest car in the event are not yet over, it was overheating again first thing this morning, and looked like a change of cylinder head gasket was now needed. The crew had packed a spare. Here in Cradock we are in the totally unique hotel where the staff jump to attention under the strict control of Sandra Antrobus, who owns the place, and has taught the establishment of the town a thing or two when it comes to enterprise. After buying the hotel on the corner of Market Street, Sandra realised what the hotel needed urgently was more rooms - this was the only way to be successful. All the banks in town refused her a loan. Undaunted, she forged ahead, eager to prove everyone wrong. Fired by a single-minded vision, Sandra bought out the butcher's shop opposite, then the cottage next door, then another shop, and like a real life game of Monopoly, kept buying until every building in Market Street was hers, and quickly converted into an extension of her hotel. So, when you come to stay with Sandra, and breath deep on the hotel's atmosphere of paraffin lamps and candles that light up all the old Victoriana that hang from the walls, you are taking in one very special place. No other hotel in South Africa is quite like Sandra's Hotel. When you are given a large old brass key you are escorted down the street and find yourself fiddling with a hundred-year old lock to the front door of a cottage. You don't get a room here, you get an upstairs, a kitchen, a front room... The whole cottage is yours. Staff leap about to attend to your every need because Sandra's regime is that of an ultra-strict disciplinarian. Needless to say, the food is excellent. Attention to detail blended with the understated elegance of a street that was so run down it was once regarded as beyond the help of bankers or council grants today looks resplendent in understated elegance... and is now rated so highly it's become a National Heritage site. As a result of all this energy, Nobody on the Cradock Town Council dares to mess with Sandra, who single handed has delivered them a hotel so special, it was once described by the food critic of Oldstager magazine as "the most memorable hotel in the world - if not the finest". The four-poster brass beds are a bit creaky, along with the the broad maple floorboards, and the wind is getting up as the sun goes down with the view out of the rattling bedroom window looking out over miles of empty plains of the Karoo... reinforcing Sandra's wish that all her guests leave her hotel with their experience of Cradock deeply etched in the memory.